The 2010 NHL season is upon us and all of your favorite teams are now in the hunt for the championship. Highland Mint has issued their new 2010 NHL Signature Rinks for every team to commemorate the 2010 season. The Signature Rinks are featured in a 12” x 20” wood frame. 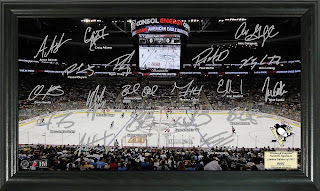 Each of them have facsimile (exact replica) signatures of your favorite NHL teams players spread out on a glossy image of their home ice and each is individually numbered. These great collector items are protected under plexi glass and each team is limited to and edition of 2010. These signature rinks are also officially licensed by the NHL and NHLPA. Check out these great new collectibles at AAA Sports Memorabilia!